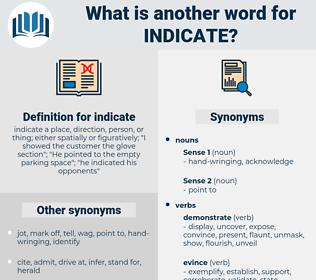 What is another word for indicate? 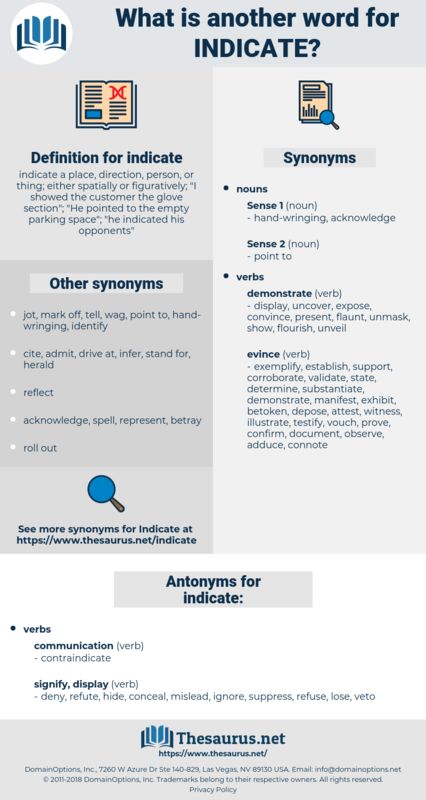 indicate a place, direction, person, or thing; either spatially or figuratively; " I showed the customer the glove section"; " He pointed to the empty parking space"; " he indicated his opponents"
cites, annotations, Recalls, says, conclusions, remarks, Does, indication, indications, suggest, shows, include. applicants, labels, guides, signs, indications. Suggesting, communicating, Mentioning, Describing, telling, Signalling, Outlining, disclosing, Advising, Stating, Quoting, Notifying. delineated, illustrated, suggested, contained, depicted, instructed, implied, disclosed, advised, Displayed, documented, labeled, pointed, Prompted, Flagged, Asked, marked. isolates, clarified, demonstrate, sources, illustrate, reveal, cite, reflect, tell, imply, confirm, say, depict, testify, dictate, prove, contend, mean, represent, suggest, contain, appear, manifest, allege, correspond, exemplify, affirm, include, believe, relate, angel, estimate, underscore, advertise, understand. demonstrate, according, illustrate, reveal, signify, cite, reflect, stipulates, tell, imply, confirm, say, depict, delineate, highlight, testify, dictate, prove, articulate, emphasize, convey, underline, mean, infer, represent, suggest, contain, appear, manifest, correspond, enunciate, distinguish, shows, affirm, remind, stressed, include, believe, relate, detect, deduce, elucidate, substantiate, illuminate, angel, translate, estimate, underscore, advertise, understand. deny, refute, hide, conceal, mislead, ignore, suppress, refuse, lose, veto. describe, announce, elucidate, spell out, proclaim, declare, explain, delineate. He might indicate that he was getting sick of this sort of thing, and would take the next chance that turned up; would, as it were, close with Fate. Her red lips curled in a way that seemed to indicate that she thought he would go. read, call, signify, register, show, record.